This guide was specifically created to help ease the minds of parents who know they will end up in a Calgary NICU, and to provide information for those who have unexpectedly landed there. As a doula I love to work with families who are high-risk and have been told to expect a NICU stay. If you are hoping to find support of someone who has been there, please reach out. Part I and III are linked via the titles below, or continue on to read part 2! The typical birth experience: You go into labour, you excitedly tell those close to you that the time has come, your body moves into the waves of active labour, your care providers reassure you that all is well and you excitedly welcome your baby into your arms. After a short time you find your new normal with a fantastic new being accompanying you wherever you go. The NICU birth experience: There are thousands of scenarios for those of you entering the NICU. Maybe you knew of a medical complication before labour, and were dreading the day labour would arrive not knowing what the outcome may be. Maybe labour started at a point where you, or baby, were not ready. Maybe something unexpected came up during your labour which caused “typical” to turn into “atypical”. Or maybe you were not in labour at all, but something drastically changed in which this baby must be born. Regardless of where you started, there was a point where you knew that what was happening was no longer “normal”. There was less excitement, and more worry. There wasn’t the same amount of reassurance. And rarely, did your baby come to your arms before anyone else's. And the worst part. Your new normal didn’t include being accompanied home by your little one. While you can find lists on lists of “What to bring to the hospital” to give birth, there isn’t exactly a Pinterest list of “What you should bring back to the hospital when you leave but your baby is still there.” So hopefully the following section will provide some insight on what is provided by our fabulous tax dollars, and what you should bring (assume this is post maternal discharge). Every NICU in Calgary has double electric breastpumps available to mothers. Some have more than others (1 pump/mom), while other NICUs you have to roam the halls (or ask your nurse) to find one. In postpartum you will be given one pack of accessories (flanges, connectors, valve & membrane, tubing and suction cups) for the pump - KEEP THESE. They are worth $70, and you don’t want to happen to throw it away and need to buy another one. If your baby is born before 32 weeks there is a good chance your babe won’t be in clothing closer to that age. Nurses need frequent direct access to check IVs, breathing gear, probes and take temperatures therefore clothing gets in the way. But it is an exciting step once your baby is able to be in clothing! They provide outfits but you are welcome to bring your own as well. Make sure they are labeled as they can get lost in hospital laundry. They will set your clothing aside for you to take home to wash. The best clothing for the NICU has snaps and not zippers (access for cords). Blankets (swaddles, sheets etc) are also provided - again if you bring your own make sure they are labeled as they can easily get put in with hospital laundry. Pillows are provided, though if you are somewhere where you intend to stay overnight (ACH or just about to be discharged) bring your own. ACH also has a shower in the family room, so bring toiletries if you intend to use that. Remember to bring cameras, cell phones, chargers, computers (all Calgary hospitals have free wifi), notebook if you want to take physical notes and anything that will help your stay feel more like home. At most of the hospitals you can ask a nurse that you like to be your baby’s primary nurse, this means that when they are scheduled they will be assigned your baby. This helps your baby have more consistency and for you to form a bond with your baby’s caregivers. You can contact your nurse via phone 24/7 to get an update on your baby. A month parking pass is worth the money ($80/month vs. $14.25/day). You may have to request a letter from the NICU to bring to the parking office to qualify. If you have a credit card, you can pay for parking at the station when you exit. Some of the NICUs host a monthly or weekly coffee meetup. This is a great opportunity to meet other parents who can relate. Each NICU has access to (or its own) kitchen, so to save money you can bring your own meals and keep them in the fridge. A microwave is also available to reheat. No food or open drinks are allowed at the bedside, so bring food in a container that can keep in the fridge (or a covered mug/bottle for the bedside). If you want to keep track of what has happened, take a daily picture of the whiteboard at your baby’s bedside - you won’t regret it later on (believe it or not, you do forget the details). 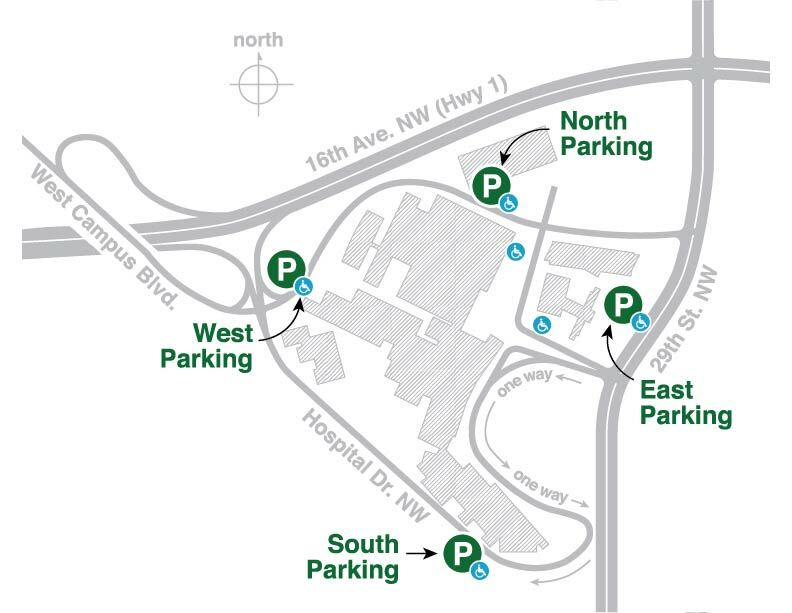 FMC is the hardest place to find parking, so drop off any freshly postpartum mama so she doesn’t have to walk 2 blocks just to get to the front door. The Ronald McDonald House provides housing for families whose children are admitted and live further than 45km from the hospital (access for this service must be made through a referral at the hospital and is dependent on availability, there is a small cost associated). The Family Resource Centre (on floor 2) can help with meal vouchers or parking if you are low income. You can also find phone chargers there if you have forgotten yours! And a washer and dryer in case you need it - just bring your own detergent. Street Parking is available for free, but might require some effort to find. Additional food options can be found across the street in the mall complex. The bedside chairs fold flat, you can ask for bedding if you want to nap/sleep . If there is space, when mom is discharged she can request to stay as a NICU lodger (you will not have a nurse or meals) and you will receive a room until they need the space. You may be requested to leave the room with short notice or in the middle of the night, so minimal luggage is ideal- you can move to baby's bedside until the morning if you wish. You can get a free YMCA pass to the YMCA in the hospital while your baby is in the NICU. Since it is not listed on the elevator, the NICU is located on floor 6. Rockyview is the only NICU with the hand washing station inside of the doors (just in case you are transferring somewhere else and are searching for the hand washing station). The chairs in the parents’ lounge recline, so if you need somewhere to put your feet up, head there! The best bathroom is to the right of the elevators (towards labour and delivery). You will have access to a washroom with a shower, and a small kitchenette and lounge with a TV. They occasionally have meals available for moms (but your nurse will have to access them for you). All NICUs ask that visitors (parents included) are well and do not present with a fever, cough or flu-like symptoms. This is to protect not only your baby, but also neighbouring babies. What might just be the sniffles to you could be a respiratory disaster for a fragile child. RSV season runs from Nov-March, and during this time visitor policies may be more restricted. Typically no children under 16 are allowed in the NICU unless they are a sibling of the baby. All visitors must sign in and out. Parents are allowed to come and go 24/7. Parents may name 5 people who they would like to allow to visit during their stay (these cannot change, siblings are not included in the 5). The parents can indicate whether these 5 support people can come and go without the parents being present. All visitors must be up-to-date on their vaccinations (including the flu vaccine). Parents are allowed to come and go 24/7. As the rooms are larger, they allow 3 people in the room (sometimes more). A parent must be present in the room with a visitor (this seems to be nurse dependent, you can sign saying you give consent for someone to visit without you there). Parents are allowed to come and go 24/7. Other visitors are allowed during the day (some exceptions for the night). Two people are allowed at the bedside at a time, a parent doesn’t have to be present (but does have to give consent in advance). Parents are allowed to come and go 24/7. Parents may name 5 people who they would like to allow to visit during their stay. These 5 people can come and go at will without a parent present. No one intends to land in the NICU. It’s a scary and foreign place to the vast majority of parents, a land of complex medical terminology and tubes and wires. But for some it becomes the place that has saved their child’s life. A place where the nurses are known by name and the bi-hourly hand washing routine is as close as you get to a shower in your postpartum days. I was one of those parents. My son, Theo, was born at 26 weeks and 2 days due to quickly escalating medical issues for which we only had a week to prepare. At 24 weeks we were planning for a home birth at term. At 25 weeks we knew I had high blood pressure and as a result our son was not doing well (IUGR and absent cord flow). And at just over 26 weeks we had to deliver due to pre-eclampsia and HELLP Syndrome. Our plans changed fast and hard. We began our 4 month journey of Calgary’s NICUs with our 1lb 2oz fighter. Over our 4 month stay we were “residents” of 4 out of 5 NICU’s in Calgary (most preemies will only stay in 2 facilities during their stay). Although the stay was incredibly difficult, now that I am on the other side I am so glad to possess first-hand experience with which I hope to help other NICU parents. Part II and III are linked via the titles below. Look below for Part One. A Level 3 NICU provides medical care to the most fragile babies. If your baby is born before 32 weeks or weighing less than 1500g there is a good chance you will give birth at a hospital with a Level 3 NICU or will be transferred there shortly after birth. In Calgary, Foothills Medical Centre and Alberta Children’s Hospital are Level 3 NICUs. Level 2 NICUs provide care to babies born after 32 weeks, moderately ill or infants expected to be discharged quickly, or level 3 babies whose condition has improved. In Calgary, Rockyview General Hospital, South Health Campus and Peter Lougheed Centre all have Level 2 NICUs. All NICUs are staffed by Neonatologists, Fellows, Residents, Respiratory Therapists (RTs) Dietitians, Nurses, Lactation Consultants, Social Workers, Pharmacists, Lab Technicians and Unit Clerks. Foothills also has a NICU psychologist. Occupational Therapists and Physiotherapists may be consulted. Most NICU nurses will be working a 12 hour shift which runs from 7am-7pm or 7pm-7am. Neonatologists typically work from 8am-4pm with fellows and residents covering the 4pm-8am shift. Within Calgary the neonatologists do a rotation where they will be at a NICU typically for 2 weeks before moving on to do another rotation either at another hospital or have a break. Therefore, if you transfer hospitals you may have a doctor that you have had at a previous hospital. Rounds occur once a day typically between 9am and noon (this will vary day to day as sometimes the team is dealing with a situation before they can all group). Rounds are a meeting in which every medical professional included in your child’s care rotates through each patient's room/pod to discuss the plan for the day. This group may include neonatologists, fellows, residents, nurse practitioners, the charge nurse, your nurse for that day, dieticians, respiratory therapists, occupational therapists and any students. Parents are highly encouraged to be present for this portion as it allows for you to express your desires and give input to the entire clinical team. Tip: Even if you cannot be present for rounds for a day but have an opinion on a treatment, intervention or approach you can call your nurse before rounds and ask for her to express your desires. You can also ask your nurse to call you after rounds to be updated on the course of action decided for the day. Details of your baby's care for the day is typically decided at rounds. This may be changing the volume of feeds your child is receiving, a different setting on his/her oxygen, introducing a medication, changing nothing at all or one of the remaining thousand unique situations relevant to your child. Your baby's nurse will take breaks throughout his/her shift, so you may see another nurse attending your child during that time. Foothills is currently the only hospital with a “quiet time” which runs from 2-3pm and 1-2am. During this time parents are encouraged to come do skin-to-skin with their baby, but to plan to be set up before the start of the hour. Parents are asked to not be coming or going with visitors during this time. This time of decreased stimulation and stress helps the most fragile babies improve their health. Remember to take care of yourself during these stressful times. Make sure you are keeping yourself well hydrated, eating on a regular schedule, taking your pain medication if you are freshly postpartum and staying in contact with your support team. FMC has multiple pods separated by curtains that can be drawn. There are typically 4 pods/section of room. As it is an older building there are few windows. The NICU is divided between a level III and level II section. There are chairs but it often requires prowling the NICU to bring one to your pod. Your individual nurse's desk is directly beside your pod. ACH has individual rooms for each baby. You have the option of closing each room with doors, or just drawing a curtain. Some of the rooms have large windows while others do not. Which room you are assigned depends on what is available. Each room has at least one chair and a couch (that can convert to a bed to stay over), and are the largest rooms of any NICU in Calgary. Your individual nurse's desk is just outside of your room where they can see through the window into your room. SHC is divided into sections with 2 babies/pod. The pods are divided by curtains and there is no solid wall to separate the pods from the main hallway. The sections are to the left of the main hallway once you enter. Although there is a computer/nurses desk right across from your baby's bed, most nurses will congregate at the main desk vs staying by baby's bedside. There is a chair by each bed. RGH's NICU is more maze-like than any of the others. You enter by the main desk and hallways split off from one another coming to various dead-ends. The hallways are animal named ("lion", "giraffe" etc). Each pod is open to the hallway but divided between by curtains. There is also a chair by each beside, but there is not much room in the pods. Nurses desk is also behind the bed, but they are typically just there for note taking, as there isn't enough room to stay at the desk and give the parents adequate room. "The PLC NICU is separated into two sections. Up from there are set of pods where babies are set up in an alcove of a larger space. Here your nurse will be stationed within the pod. The back portion of the NICU is individual rooms, and generally these are used for families with multiples. Here your nurse will be stationed just outside your room. Each room has a glass door which can be shut, a recliner, a bench/bed and a locker. These rooms also have a dedicated breast pump for you to use during your baby's stay. Generally PLC also has access to a washroom with a shower, and a small kitchenette and lounge with a TV. They also occasionally have Momma meals available in the kitchen, but your nurse has to access them for you."